February 2014 | Manny Vergel spaces out! This article has been updated to reflect the awesome actions done by Moonshine. This is not a review of the Moonshine Bar and Restaurant in Makati. It's just a minor rant. Okay, maybe I'll add in some review. The first time I went to Moonshine Bar I was so delighted that I gave a compliment to the owner of the restaurant. Their cocktails, even though a little expensive, are quite good. The salmon I ordered was perfectly cooked. I like the ambiance too and the playlist. The place is located beside Distillery, Jupiter. The 2nd or 3rd time we were there was last week when we partied til dawn in Moonshine, and it was fun; maybe a bit too much because I left my credit card. I wasn't aware of it until a friend of mine called to tell me. Today, I visited Makati again to get my credit card from Moonshine. I invited my friend for a couple of drinks.. it was supposed to be just another laid back Thursday night. We went there and it was empty. I thought, great! Some peace and quiet. I got my credit card and we ordered some drinks. [Update] Moonshine apologized for what happened. I think there was a miscommunication between the upper management and the staff. See more details below. We were supposed to go to a coffee shop after because I needed to copy an installer and try a game we researched about. Then we saw that there's an outlet near the table.. we decided to open our laptops and try the game since there weren't much people anyway, and it is to my judgement that we weren't bothering anyone in doing so; I think there was only one group outside, and a couple in another table. That was it. We were even assisted by a waiter when we plugged in our laptops. He joked that it was P120. Actually I didn't mind if we pay, but he said he was just joking. When we finished our first drink, we ordered another round. After a while, I noticed one waiter (or not sure if he's the manager) was regularly checking our bottles. I was a bit annoyed. It didn't stop there, he started asking us if we'll order some more even though we were only half way through our drinks. I felt it was kind of rude. Maybe the way it was said, I felt that they were implicitly telling us we weren't paying enough to justify the use of our laptops; I also didn't like the tone how it was articulated. I would understand if there were people waiting for a table, but even so, it was still rude. And if that's the case, we'd be sensitive enough not to use our laptops esp. if there are many customers. He was also inconsistent.. after a while, he suddenly said we weren't allowed to use our laptops, then I asked him to reiterate what he just said because I was quite confused. Then he changed the topic that we should just order more. I said, if we weren't allowed to use our laptops then why assist us in the first place, why not just said that we weren't allowed to do so. So what is it really then? I'm disappointed with what happened so we just left. I was supposed to order some more because I was getting hungry, but after the incident, I lost my appetite. I think staff in general like in restaurants, malls, etc should have more training. Training for being polite, avoiding unnecessary comments, avoiding being rude to customers, being articulate and explaining policies in a way that's not offensive. On the bright side, I'm glad how Moonshine handled the situation after. They were very apologetic and they explained (clearly, this time) what happened. I'm satisfied with the explanation, because at the end of the day, it's better to get a clear image of what really happened. Like was there a policy prohibiting the use of laptops in the restaurant or why were we troubled persistently with petty annoyances. My sincerest appreciation goes to Renz Mediarito of Moonshine for taking precise actions to what happened. My faith in humanity is restored. I still like the place and will definitely go back and recommend it to people I know. There are times when you want two Paypal accounts, e.g. you currently have a personal account but you want another account to handle your business or premier account. 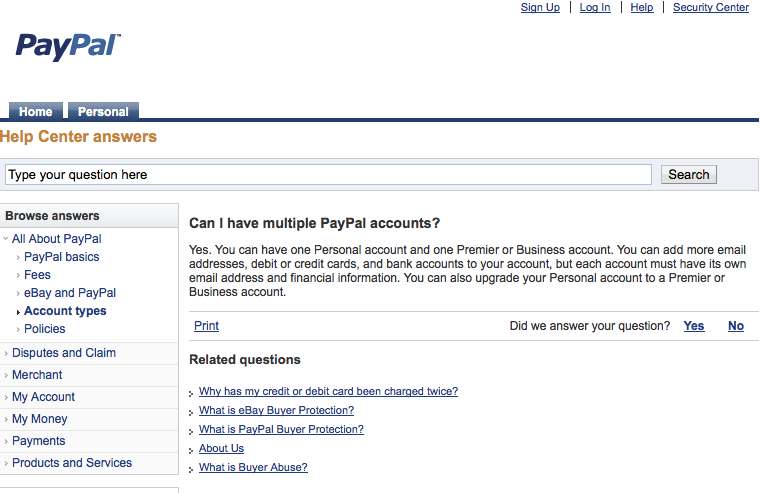 For this case, Paypal is allowing an individual to have two accounts: one personal and one premiere / business account. However, you can't register the same credit card in more than account. For this you have to use a separate credit card, or remove the previous one and register it to the new account. In summary, it's not illegal to own multiple Paypal accounts. Yes. You can have one Personal account and one Premier or Business account. You can add more email addresses, debit or credit cards, and bank accounts to your account, but each account must have its own email address and financial information. You can also upgrade your Personal account to a Premier or Business account. [Update] You can sign the petition for Globe to remove the capping here. Thanks JP for sharing the link. Last year when iPhone 5 was released, I subscribed to Globe's 1,799 postpaid plan because it promised Unlimited LTE to its iPhone 5 users. All of a sudden, Globe released a fair usage policy (FUP). What happened was my unlimited LTE data became limited to 3GB per month. It's stated in Globe's FUP that Mobile surfing offers from Globe are generally meant for emailing, browsing and search activities. Seems awfully strange to read that line after I was offered an unlimited 42mbps data plan. I want to downgrade because I'd like to get a DSL instead with no nonsense capping, and I'm okay that I can only use it at home, at least it's unlimited. Globe's unlimited LTE is not worth it anymore, I'm more than satisfied with powersurf 99 if I can't use my unli data plan for downloading and streaming. It would be more acceptable if my LTE connection were to be downgraded to 3G. Anyway, I don't know which committee should decide on this, is it the NTC or the 'madlang people'? Nevertheless, I feel deceived by Globe's false advertisement. The cartoon below summarizes how I'm feeling about Globe's FUP. Credits to Sir Roy for the rotten banana logic and convo. I intentionally wrote Unlimited LTE instead of Unlimited Data Plan even though fewer people can relate to it. Unli data is not a compelling argument since Globe is insisting that the data is still unlimited. So my argument is why advertise unlimited LTE when it's not really unlimited?